Do you remember the first time you shopped at a supermarket? I do. We’d be waiting for a supermarket to open in our town for years, and I remembering thinking what a luxury it would be to have all the things I needed under one roof. Very naively, when a supermarket did open, I expected to be in and out within 15 minutes. But the rows and rows of products – aisle after aisle – made me feel dizzy. The choice of pet food alone gave me an unnerving sense of apprehension. I remember walking around for what seemed like hours looking for the most obscure items my husband had sneaked on to the shopping list without me noticing. In time, however, I learnt to speed up the weekly shop – it became easier and more enjoyable. I started to remember the kinds of products in every aisle, and wrote my shopping list in a logical order specific to the layout of the supermarket. All I had to do was walk round in a certain direction, ending up at the self-service checkout to avoid the queues. I was able to eliminate actions that didn’t add any value to the process, standardize behavior that helped to speed up the process, and optimize the use of my shopping list and the self-service checkout for maximum efficiency. Today, of course, automation and robotics can deliver an efficient and personalized shopping service, without you having to leave the house. Multinational DIY retailer Kingfisher – which owns B&Q, Castorama, Brico Dépôt, and Screwfix – has taken this one step further by designing an app that allows you to design your own bathroom, helping DIYers to reduce costs and increase chances of successful completion of their bathroom projects. This app has not only given me independence from having to phone up my ex-husband for advice, but also provided professional and technical DIY expertise, without having to make an appointment with a customer service representative. Eliminate – identifying and getting rid of all unnecessary activities that impact time, cost, and effort. Addressing and eliminating the cause of waste and barriers to services shifts the focus to more value-added activities in your business operations, such as analysis. Standardize ­– carrying out similar routine processes in the same repetitive manner by using standard templates to run transactions with less time and effort. Standardization is a way to avoid the cost of ERP customization and drive best practice across your business operations. Optimize – using all the functions of your existing tools to the maximum effect. Organizations often have the right tools, but don’t know to use them effectively. Optimization is a way to derive the maximum utilization and capabilities from what you already have, including your ERPs, tools, processes, and workflows. Automate ­– leveraging easily configured best-of-breed tools to automate standardized manual processes. Automation reduces or eliminates manual work, while delivering increased transparency and control over the process, with extremely high levels of accuracy. Robotize – deploying robots to drive efficiency in any remaining manual, repetitive, rule-based activities by simulating the activities of a human operator. 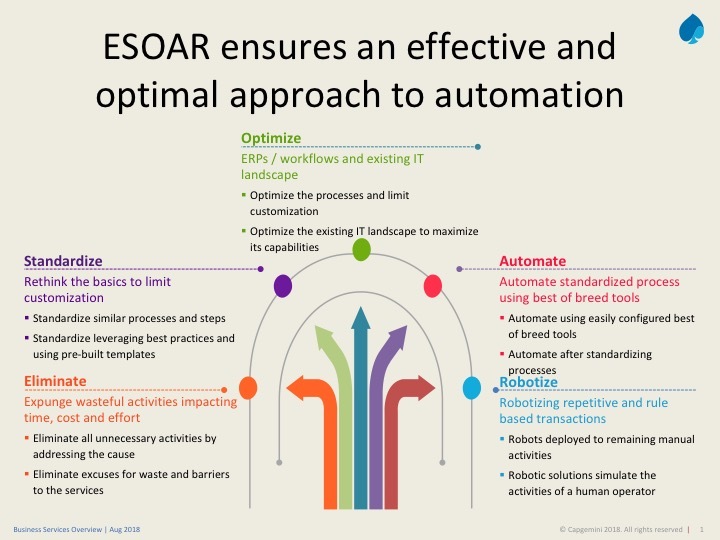 By re-engineering your processes in the context of intelligent automation, ESOAR sets the agenda for a holistic approach to transformation of your business operations – enabling you to implement straight-through processing and automated solutions, while delivering the enhanced outcomes to your business users. Leveraging the five ESOAR steps in the correct order to review your business operations not only identifies opportunities to eliminate processes up front, but gives you the best return on your existing investments in technology and ERP, redirects resources from repetitive tasks towards higher-value business activity, and drives best practice. Simple logic can deliver the best results. Kamila Sicinska leads the Polish business process transformation team in helping global players to set up their transformation agenda, and transform their processes, technology, and organization.